Kettle-drums, standards and other insignia (and presumably grenadier mitres) had to be carried to Königstein which was be a neutral fortress throughout the war. The King of Saxony would retained his liberty of movement. Officers were allowed to leave providing that they gave their parole not to serve against Prussia during the war. The rank and file and NCOs of the army (some 14,000 men), with all its equipment and munitions, was compelled to surrender (and eventually to join the Prussian army). Most of the infantry were simply formed into new Prussian regiments, against the advice of Frederick's generals, who suggested, rightly as it transpired, that they would just desert en-masse. The cavalry, on the other hand, were distributed amongst the Prussian cavalry regiments. An interesting side-question is what happened to their original uniforms? Were they allowed to retain them or were they all confiscated? (mentioned in my previous post) mustered about 7,300 men by October 1757. 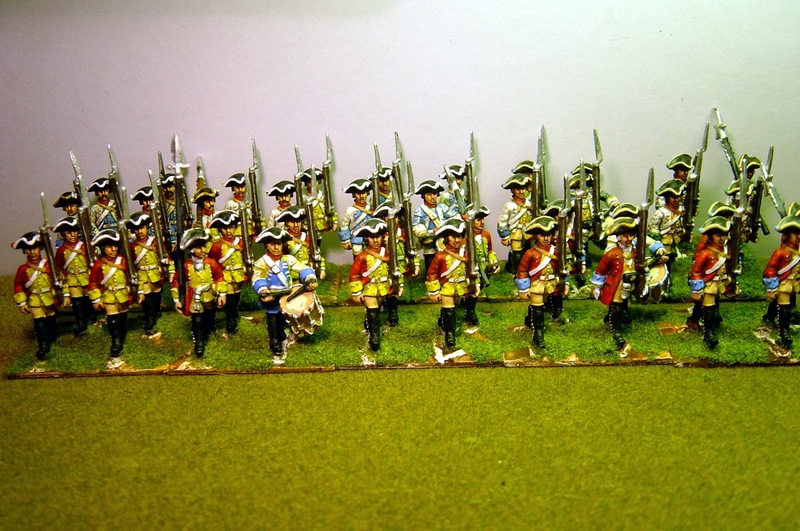 With a subsidies contract dated March 11 1758, the Saxon army was taken into French service. To avoid further contact with the Prussians, it marched through southern Germany and had assembled in Strasbourg by July 1758. It had then joined Contades army in Westphalia by September 1758. As part of Chevert's and Fitzjames' divisions reinforcing Soubise's army in Hesse, the Saxon contingent first saw action at the battle of Lutterberg (October 10 1758) where it's determined attacks decided the day for the French army. The Saxon contingent had a total book strength of 10,000 men. Organisation slightly changed during the course of war, but its book strength remained at 10,000 men. Effective strength was often far below as a result of continued desertion and recruitment difficulties, especially during the latter campaigns of the war. Now to the question of converged grenadiers. Firstly, I assume that they had lost their exotic headwear which was, presumably sitting in the fortress of Königstein, and so they were all issued with tricornes. Then some of the 'new' regiments had grenadiers that were formerly infantry while some had grenadiers that were formerly cavalry and wore a semi-cavalry uniform. I say semi-cavalry because the coat and small clothes would have been 'cuirassier' whilst the straps and other leather equipment would probably have been fresh issue suitable for infantry use. Another assumption is that the ex-cavalry were not formed into cavalry units because of a shortage of mounts. 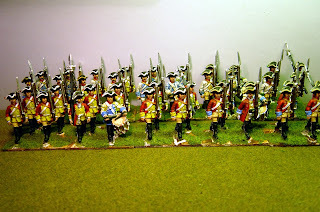 So I'm showing two converged grenadier battalions here with assorted mixed companies. The first battalion (middle picture) shows three companies of the Leibgrenadiergarde (red coats, yellow facings – true infantry) and two companies of the ex-cavalry regiment Gardedukorps (red coats, blue facings ). one company of Grenadierbataillon Kurprinzessin (pale blue facings – true infantry), one company of IR Minckwitz-Vitzthum (blue facings – ex-cavalry regiment – the first name being the infantry designation, the second the cavalry regiment from where the uniform came) and one company of IR Rochow-Plotz (green facings – ex-cavalry regiment). The exact pairing is difficult to be sure of and that combination is my speculation. I've had to make quite a few assumptions here so I hope you will bear with me. Maybe if I can get my hands on the German book I've previously mentioned, some of these can be resolved. Confused, hmmm, so am I!! Given the difficulty of obtaining precise information, I think you've done quite well. Impressive research! Fantastic figures too. A great post and some beautiful units!